Anna Hazare is an Indian social activist and prominent leader in the 2011 Indian anti-corruption movement, using non-violent methods following the teachings of Mahatma Gandhi. Hazare also contributed to the development and structuring of Ralegan Siddhi, a village in Parner taluka of Ahmednagar district, Maharashtra, India. He was awarded the Padma Bhushan — the third-highest civilian award — by the Government of India in 1992 for his efforts in establishing this village as a model for others. Anna Hazare started an indefinite hunger strike on 5 April 2011 to exert pressure on the Indian government to enact a strigent anti-corruption law as envisaged in the Jan Lokpal Bill, for the institution of an ombudsman with the power to deal with corruption in public places. The fast led to nation-wide protests in support of Hazare. 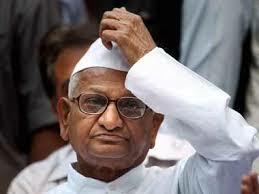 The fast ended on 9 April 2011, a day after the government accepted Hazare’s demands. The government issued a gazette notification on the formation of a joint committee, consisting of government and civil society representatives, to draft the legislation. When government refused to adopt a strong Lokpal Bill, Anna went on another fast and the India against Corruption team unleashed the power of the people, forcing the government and the parliament to adopt a resolution in support of a strong Jan Lokpal Bill.